Building a small form factor gaming PC or HTPC is all about maximizing your space while keeping the features you can have on a full-sized gaming rig. In this post, we’ll take a look at a few good SFF motherboard for your Intel Z270, B250 or previous generation H110 or B150 LGA 1151 system. These boards not only give you fantastic value for the money you spend, they manage to give you the flexibility you need for your system. We’ve narrowed it down to 5 options we really like. While all of these boards are technically compatible with 6th generation Skylake and 7th generation Kaby Lake, keep in mind that Z170, H110, and B150 chipsets may need a BIOS Update if you plan on using Kaby Lake. If you want a SFF or small form factor gaming PC that performs like a full-sized one, the MSI Pro Carbon Z270I is a good place to start. It has support for the latest M.2 NVMe drives as well as a full-sized graphics card. In addition, it has full customization for your LED lighting and all the fan headers your mini-ITX system needs for its cooling system. It also includes some fantastic looking carbon fiber heatsinks as well as subtle RGBs on the board itself. 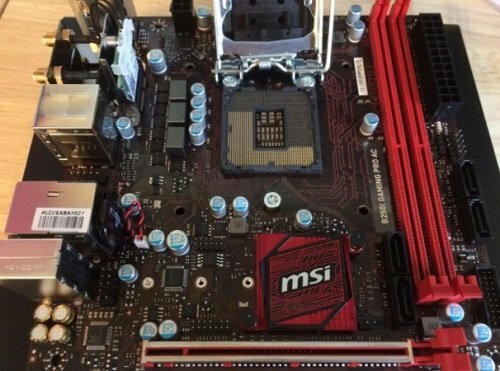 What sets this board apart from cheaper boards is MSI’s insistence on using high-quality parts. You get the PCI-E steel armor that prevents your GPU from bending, Intel Gaming LAN for better connectivity, and fantastic sound with the audio boost 4, amplifier, and Realtek ALC1220. Having the audio removed from the motherboard like this means you get a better audio signal overall. On the downside of things, this board might be too expensive for those building a SFF HTPC who don’t plan on heavy gaming. It’s clearly made with a gaming style and approach in mind which you pay for. However, if you’re looking to make a high-end SFF, the MSI Performance Gaming Pro Carbon is a good place to start. In addition, with Intel’s recent release of Z370 Coffee Lake motherboards, some may prefer to go in that direction. If you’re looking for a less expensive motherboard that has many of the same features as the Pro Carbon take a look at the Gaming PRO AC B250. It’s not a Z270 chipset motherboard, so it doesn’t have the overclocking or higher Ram speeds than 2400MHz; however, in terms of base clock and in-game performance, I think you’ll find it performs similarly. If you understand its limitations, this board might be all you’re looking for without the extra price. Put this together along with an energy efficient i5-7500 or even a “T” processor, and you’ve got a budget small form factor PC with plenty of performance for games. Having built a similar PC myself, I’d recommend you get Steam, grab some Xbox 360 controllers, and use it as a gaming console as well. If you’re looking for speed, this board is compatible with the latest M.2 NVMe drives as well. 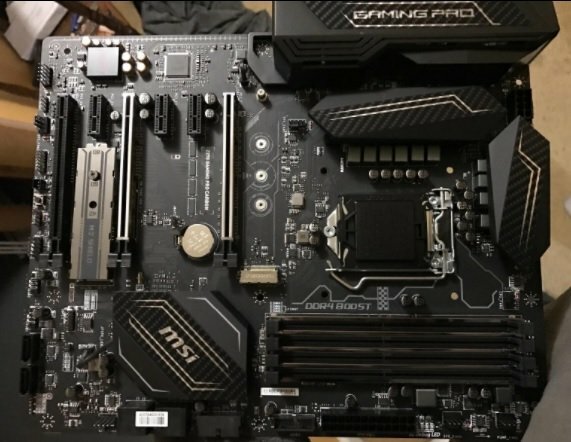 Overall, the MSI Gaming B250I is a good mid-range board with plenty of features for your build. There’s not a lot of flare here, although the Mystic Light Sync and red and black scheme is ok, but you don’t really pay for it either. ystem with temperature sensors for monitoring your hardware inside the case. 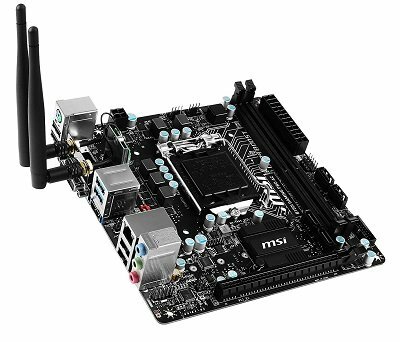 Like most m-ITX boards the M.2 is located on the back of this board. So, you’ll have to unscrew the offsets, and turn it over if you ever plan on removing it. However, I think that’s a trade most of us are willing to make with SFF builds. This is another ITX motherboard that could be overkill for those of you looking to build on a budget. However, for those that want a small gaming PC, this one will give you the overclocking and cooling features of the large boards without the size. Although this board certainly won’t overclock as well as the high-end ATX boards, you should be able to get around 5GHz with 1.33V. For M.2 performance you’ll be able to get a read speed of around 3300MB/s with something like the Samsung 960 Evo. So, there’s certainly not a problem there. Overall, it’s a mid to high-end Z270 Mini-ITX board with overclocking features, plenty of SATA ports, and a great onboard audio. Although you can use this board with Kaby Lake processors, you may need a BIOS update. That being said, going with Skylake certainly isn’t a terrible option here. In fact, if you can get it for cheaper, Skylake is almost identical to Kaby Lake in terms of instructions per clock or IPC. Yet, this board should still cost you around $70. It’s a decent price, albeit we’d like to see it at around $50 at this point. That being said as the board comes with Wi-Fi support, it’s as cheap as any you’ll come across in its category. It comes with support for up to 32GB of memory at DDR4 2133 speeds only. So, save some money and stick with inexpensive ram if you go with this board. For audio, it uses the Realtek ALC892 chipset. This is a solid option. Overall, this is an inexpensive board that performs well, has plenty of features, and would be ideal for that HTPC you’re trying to build. The Wi-Fi antenna was a bit difficult to setup, and clearly some better design options need to be made here. However, once we got it working it was just fine. Here’s another inexpensive mini-ITX option. The MSI B150I Gaming Pro has support for up to 64GB of DDR4 memory. Like the H110 chipset above, it won’t support ram beyond the 2133 speed. It’s possible that, with this particular board, it’ll come with an updated BIOS. Ours certainly was. 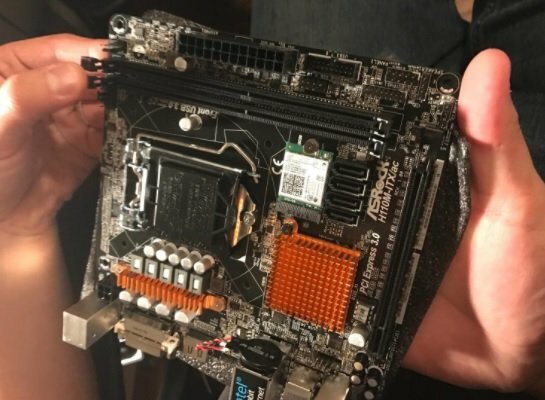 So, if you want to throw a Kaby Lake processor in here, you should be able to do so without much hassle as long as you don’t get an older board. The great thing about the B150I Gaming Pro is that it still has tough components like MSI’s enthusiast class. So, there are solid caps and Titanium chokes. In addition, you get the VGA armor in the PCIe slots. For audio, you get the Realtek based Audio Boost 3 which we found to be a fantastic option. Overall, if you’re looking for a gaming-based motherboard that doesn’t cost a lot, the MSI Gaming PRO AC B150I chipset motherboard, is a decent option. It’s available for around $80 which is definitely better than the $120 price tag we saw last year. That’s our wrap-up of our favorite Intel Mini-ITX motherboards for Skylake and Kaby Lake. Be sure to let us know what you think below. Rather go with AMD? 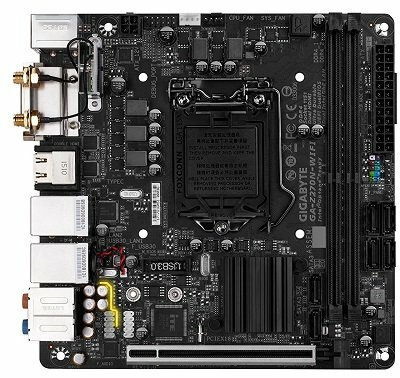 Also take a look at our top AM4 X370 motherboards as well as our favorite Budget AMD AM4 B350 boards.